Sunday was a very welcome opportunity to relax after several jam-packed days. We got up late (by coaster trip standards), enjoyed a relaxed breakfast, then headed to the airport for a lunch time flight to Kazakhstan. We thought about trying to tick off one or two of the shopping mall coasters in Almaty, but decided instead to enjoy a quiet evening comprising traditional Kazakh cuisine and Red Button, an escape game set in the 1960s during the Cold War. Our group managed to prevent the launch of missiles (and thus a third world war) with a few minutes to spare. The early night that followed left us fully refreshed and ready to go again. Кок Тобе, or Green Hill, is an amusement park located on the side of a mountain to the east of Almaty. It is possible to get there by road, but it is both easier and faster to take a cable car from downtown, a scenic journey lasting around eight minutes. 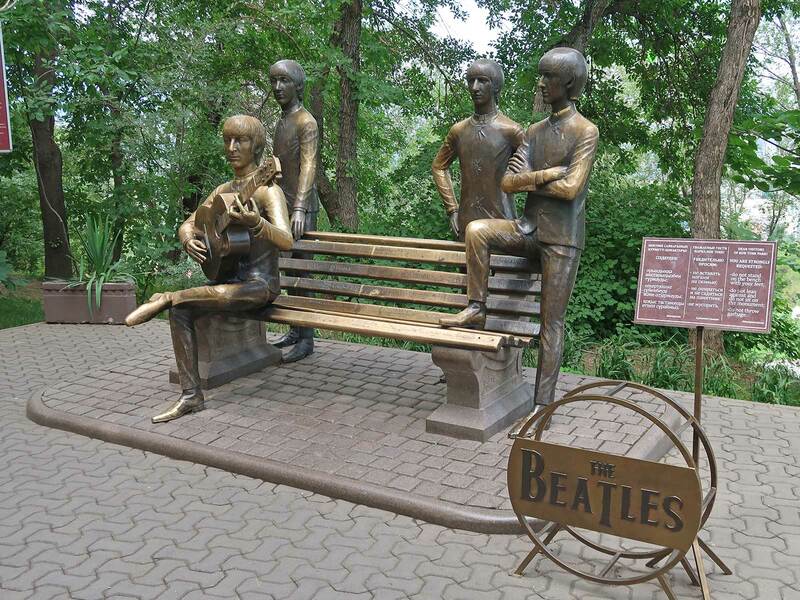 The park is featured in guidebooks primarily for a bronze cast of The Beatles by sculptor Eduard Kazaryan installed in 2007, apparently the first monument anywhere in the world to show the four singers together. John Lennon is depicted in a seated position with his guitar, with Paul, George, and Ringo standing nearby. Fast Coaster is as of this writing the only known alpine coaster in Central Asia. Signage at the entrance indicated that it should be available between 10:00 and 23:30, though there was nothing happening when we arrived a few minutes after the advertised time. In due course some staff appeared with hedge trimming equipment, climbed onto sleds, and disappeared out onto the track. When they hadn't returned an hour later our guide made some pointed enquiries, and that had the desired effect; moments later the electronic turnstile came to life and we were able to board for ourselves. Unlike many similar rides the tickets are priced per sled rather than by number of riders. To that end, two people can ride together for 1500 tenge (~€3.55). 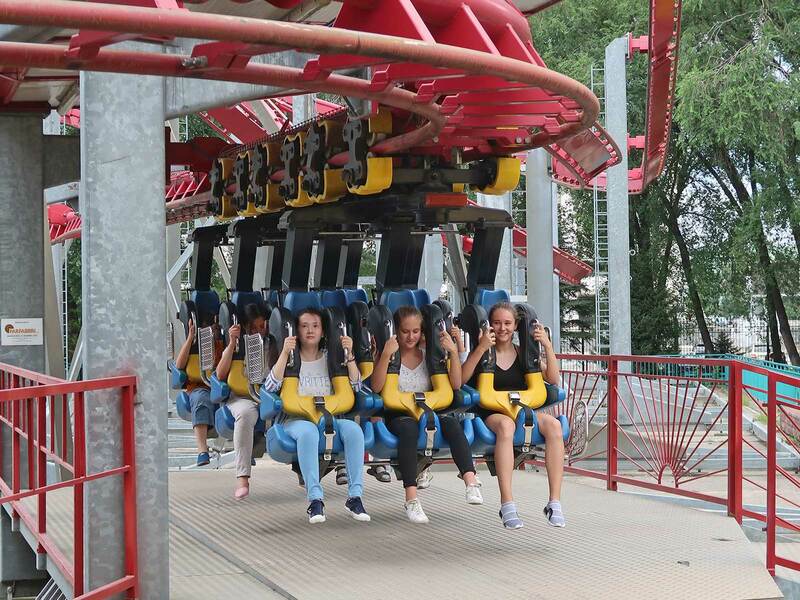 There is an optional charge of 5000 tenge (~€11.85) for those who wish to take photos or video on board, though this comes in the guise of a fine for violating the official code of conduct, and as such presumably includes a complimentary ejection from the park. Enthusiasts are advised to save their cameras for the cable car, which passes directly over the main portion of the layout. The experience is classic old-school Wiegand, with no automatic braking and a varied routing comprising numerous turns and airtime bumps. The park also includes both 7D and 9D Cinemas, Bumper Cars, a Giant Wheel, a Haunted House, a Pirate Ship, a Reverse Bungee, and a Tilt-a-Whirl themed to Angry Birds. Unfortunately all of these attractions were just as idle as the coaster had been. Readers retracing our steps should probably aim to visit the park either on a weekend or in the late afternoon and evening, and it might be worth arranging a guide of your own, as I doubt we'd have gotten on the coaster without one. Fantasy World is unique among the parks in Almaty in that all of its attractions are included in the gate admission fee of 3500 tenge (~€8.29). In principle this is a good thing, as it provides guests with an affordable day out, but in practice it results in a complete lack of urgency in operations that makes visiting an exercise in frustration. The inefficiency is particularly galling because the park is otherwise pleasant, with decent landscaping and a good selection of rides, not least a set of tea cups themed to the Hard Rock Café chain; it would be a credit to its owners if only it was run a little better. Our visit started on a slightly sour note as we were denied permission to ride Take Off, a Fabbri coaster with an oval track, a number of airtime hills, and a model dinosaur at its centre. There was a posted height limit of 140cm (~4ft7in) that had been taped over a different number on the physical sign, perhaps accounting for why an enthusiast group that visited a year before we did managed to tick it off. Our guide found a member of park staff and did his best to negotiate on our behalf, but to no avail. There was no point in dwelling on the issue; it wasn't our first refusal, and it presumably won't be our last. We regrouped on the Giant Wheel, an open model with six plastic seats in each car. There was no queue, and given that we decided to split into two groups of three so as to leave the maximum amount of space for photography. The operators were insistent that we should occupy specific seats in each car for balance reasons, going so far as to ask two of us to swap position when it became evident that they'd guessed our weights incorrectly. We were happy to comply, though I did find myself thinking that the paranoia level was a little over the top. There were two good pictures from the apex, one featuring the coaster we'd missed, and the other featuring a half dozen rides with some of the city in the background. 30 seconds of the lift hill chain running warning of an imminent dispatch. 20 seconds for the train to get from the station to the base of the lift. 40 seconds for the train to climb to the top of the lift. 40 seconds of coasting from the apex to the mid-course brake. 60 seconds while the train sits stopped in the mid-course brake. 25 seconds for the train to complete one descending turn to the final brake. 15 seconds while the train sits stopped in the final brake. 30 seconds for the train to get back to the station. 160 seconds to load and unload nine seats. This artificially elongated cycle resulted in a three quarter hour wait, giving us ample time to estimate the throughput at no more than seventy-five guests per hour. The park also halts operations for four brief windows each day, two lasting fifteen minutes and two lasting twenty. This is arguably reasonable in a twelve hour operating day when there is only one operator per attraction, though it's worth noting that it shaves almost ten percent off what was already a pathetically low capacity figure. The best estimate I could come up with for daily throughput was around 840 guests, in sharp contrast to the 1080 per hour quoted by the ride manufacturer. I'd love to be able to say that the ride experience compensated for the wait, but honestly the most positive point I feel comfortable making is that the train negotiated the track fairly well. There are one or two jarring moments in the layout where individual pieces were joined together, but for the most part the comfort level was fine. The layout isn't the most exciting in the world, and the sixty second stop in the mid-course brake renders the descending turn at the end even more flaccid than the top level of a Wacky Worm, but the locals still appear to love it, and at the end of the day that matters far more than the jaded ramblings of a bad tempered enthusiast. The entrance to Family Park is marked by a collection of retired military hardware, including a helicopter, a fighter aircraft, and several tanks. Today all were being used as climbing frames by small children while their parents enjoyed a chat and a smoke nearby. I spotted an elderly local looking on in obvious disapproval, leading me to wonder whether he might have operated or perhaps serviced some of the machines in their prime. A handful of amusement rides can be found about five minutes walk from the gate. The machines are old, but for the most part appear to be in showroom condition. 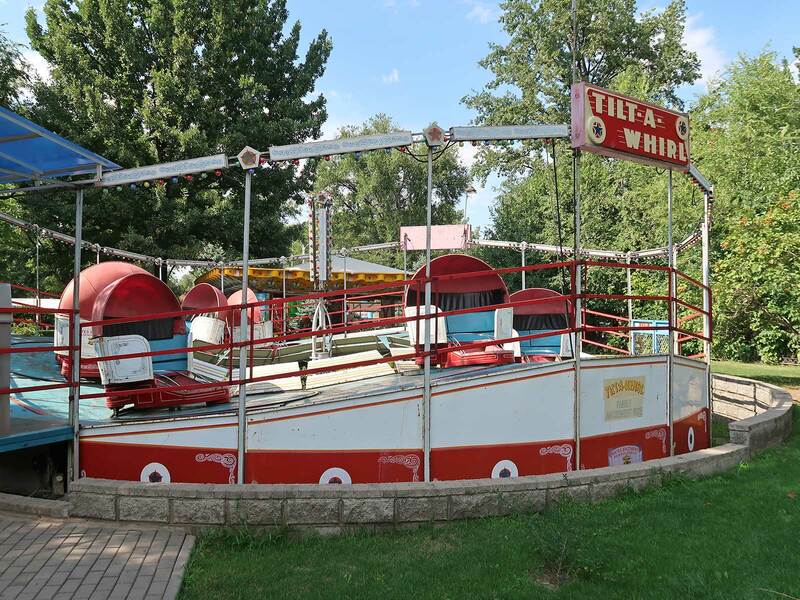 It was particularly interesting to see a Sellner Manufacturing Tilt-A-Whirl still wearing titles from the Bates Brothers Amusement Company in Ohio over ten thousand kilometres away; one suspects that the branding was left in place to impress those for whom America remains a mystical place. The park also features a one acre water play area with a pool and slides. There are two roller coasters in the mix, and both cost 600 tenge per person (~€1.42). Cyclone (#2471) is a standard layout Interpark Cyclon, and it delivers a decent if standard ride experience that leaves no lasting impression. We were rather more taken by Switchback (#2472), the only surviving roller coaster from Luxembourg-based FAB. The layout is a double figure eight that is as near as matters the same as the large format Zierer Tivoli, but the experience is considerably more thrilling due to stronger forces and reduced track clearances. The resulting head choppers are dramatic; readers should definitely keep their arms down while riding. (Signage in front of the ride indicates that it dispatches once every twenty minutes. Officially this is to allow the wheels to cool down, an interesting challenge in 30°C weather, but as ever it seems more likely that the real reason is to save on maintenance costs. On the plus side, a thirty-six seat train dispatching three times per hour still has significantly better capacity than the star coaster at Fantasy World). Our fourth stop of the day was supposed to be at Fantastic Park, a family entertainment centre in the Sputnik Mall, which we knew to contain a SBF family coaster with cars themed to look like aeroplanes. Unfortunately we were a few months too late, as the place had gone out of business. Some of the rides had been moved into an outside area next to the car park, but sadly the coaster was not among them. Our bad luck continued at Happylon in the Mega Park Mall, where the Paris Station figure eight spinning coaster was closed for its annual overhaul. Several of the drive motors had been removed from the track and could be seen in various stages of disassembly, suggesting that major work was underway. Our guide made some quick enquiries, and learned that the ride had been shut down a week before and was now awaiting the delivery of some replacement parts. Central Park, formerly Gorky Park, is an entirely typical Soviet-era urban park with over one hundred acres of landscaped gardens. 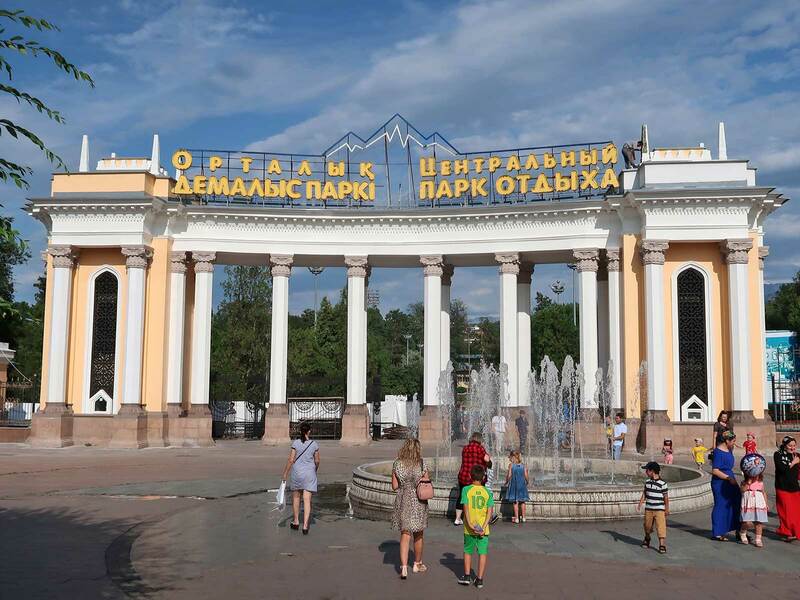 The place is home to the Alma-Ata Children's Railway, the only miniature railway in Kazakhstan, though our guide told us that the ride in question has been out of commission for some time due to budgetary constraints. 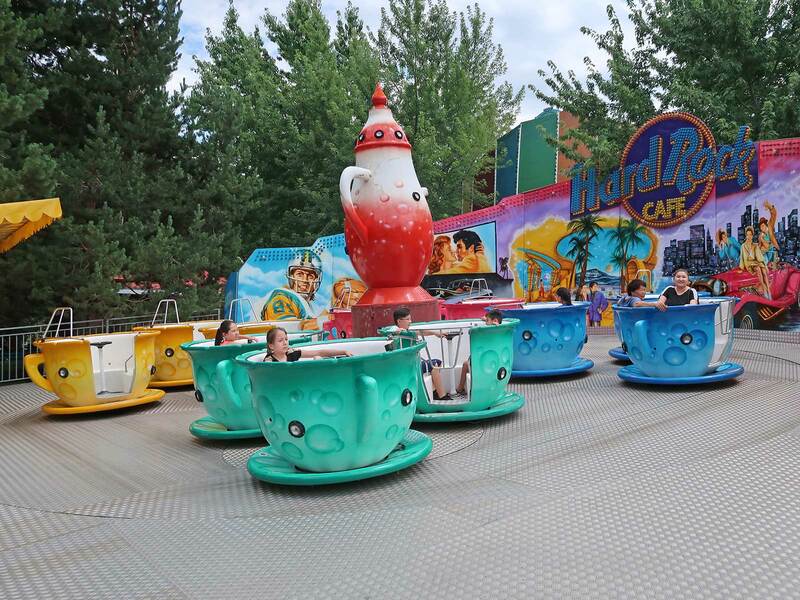 There are also two sets of amusement rides, one on the eastern boundary of the site geared at teenagers and adults, and a second for younger visitors on the southern boundary. The latter is home to a small roller coaster. Caterpillar (#2473) is a standard layout Wacky Worm of indeterminate provenance with a five car train rather than the usual six. The track looks perfectly normal from ground level, but for whatever reason the upper portion of the layout is traversed at a noticeably faster pace than usual. There would almost certainly have been respectable airtime on the drop had it not been for an aggressive trim brake that pulled back almost all of the speed. We were given three laps for our money.